Lowest anime score in this season... even lower than Ulysses: Jehanne Darc to Renkin no Kishi. You might wonder why i still give score "7" to this. This is anime is more than meet the eyes, completely underrated and piece of dark gem in all fake glittered gems. Despite the total use of Kemono Friends like CGI as art and animation it's not stopping this anime to become good. The idea of 5 persons with all of them have super power but feel reluctant from using it since it's become a bother rather than convenience, that's depicted reality. Superpower if truly happen in real life it's just get in a way of your daily life. But there is one part of this anime that shine the most even among the high scorer and very popular in this season. The Ad-lib part, brought by the same director of Tesagure Bukatsumono! and also half of its cast member (thought the ad-lib part not as long as duration of ad-lib from Tesagure Bukatsumono!). The unique humor which the VAs brought up even sometimes reveal some bits of their true nature, It's as if you were listening to a Seiyuu radio. To put it simple, this anime one of those "not for everyone anime". It's a unique anime to watch for some humor and chilling out. Also if you are into some VAs in the Himote House VA list you might get to know them even more by watching this. To start, Himote House off the bat looks pretty bad. I have to admit that I was in that same boat. I mean, the score is pretty far down there and if you are turned off by CGI, then your opinion may be influenced by those factors. I think, however, there is more this show has to offer that has made it enjoyable to watch. The show is a non-episodic comedy about 5 girls and a cat who all live together in a shared house. They put on silly gags that might leave you asking, “What did I just watch?” at the end of the episode. At first, I hated this feeling. I am not generally the biggest fan of predominantly comedic anime (Asobi Asobase and Grand Blue in example from this year), but this one struck me a bit different. The silly gags weren’t all that amazing (although there were a few that I really enjoyed), but they had improv sections at the end. These improv bits had me rolling every time. I explained it to one of my friends that I felt like I was listenining to a podcast or something of the like. This is a take I don’t see a lot in anime and I think it ended up working out well for them. That was probably my biggest hook. The characters all had different traits that attributed well to one another, but didn’t really make any of them stand out which isn’t necessarily a bad thing. This allowed the focus of the show to be on the comedic value that was set in place rather than the characters. It would have been a lot harder to pull something like that off if the show weren’t a short and if it were episodic. They definitely made a good choice in that department so there is some credit due there. As I mentioned earlier, it is CGI so I don’t need to say much on the animation of this. I think it is definitely lower quality CGI than what I would come to expect in 2018. It reminded me of my first reactions of Kemono Friends. I almost just wanted to stop watching, but I got over that and continued to watch (and no regrets). I am not sure of the budget of this show or what exactly went on when the show was initially created or if it had any similar problems to Kemono Friends, but I think it worked out if you look past the CGI. If it means anything to get recovery points, in the ending, they have 2D animations often with references to other anime. I think they are very well drawn and I enjoyed seeing them every episode. I’d like to end with some of the music. As they are ten minute shorts, there isn’t a lot of music that goes into them, but I enjoy what there is. We can take a look at the OP, the main theme of the show, and the ED. The OP doesn’t really stand out to me but it certainly isn’t bad. It is a pretty lax song that helps set the mood of the show being pretty laid back and funny. The main theme usually plays at the start of the first gag of the episode and it is pretty fun and it reminds me of Sublime’s Santeria. The ED has two versions: the one with words and without words. Most of the time, the ED is in the no words form which is just a piano. It is a relaxing way to end the show. They use the vocal version after one of the more powerful episodes in the show and it felt so right. After listening to the full version, I can’t help but to love it a bunch. If you get a chance and you like the piano version, I would recommend finding the full version somewhere. Verdict: If you are in for a few good laughs from something that is a bit different in the genre, I would advise keeping an open mind and looking past the CGI to get good enjoyment out of this show. I would love more. Himote House was a fairly intriguing show with many obvious glaring issues thinking back on the show now. The show had one of the dumbest first episodes in which they try to introduce some semblance of a premise or reason for why the main characters get together. I knew before watching the anime that it would be a comedic short so I wasn't expecting the strongest story but even then, the way that they went about the set-up for the comedic moments was chaotic and often not in a good way. The art was just as bad, with the bland CGI character models along with the way they animated, made it feel like I was watching something with low effort put behind it. The soundtrack was okay but very forgettable at times. However I remember feeling like the use of sound effects when it came to the comedy was decent. The shining light as far as I'm concerned in regard to Himote House, is the characters or more specifically the seiyuu behind the characters. They brought life to the show when it might have been very easy to write it off as having none at all. They shone especially well in the segments of the show that felt like it was unscripted. This lent itself well with the apparent chaos of the show and served to make the comedy more enjoyable despite the faults of the show. In conclusion, Himote House is not a show I can recommend because of how bad some aspects of the show is, however the great seiyuu along with the short run time, makes it a more palatable watch. Tokiyo Himote is a secretly part of the Brando family!!! No seriously though Himote House is more an ad-lib anime than an anime of where cute girls have superpowers. 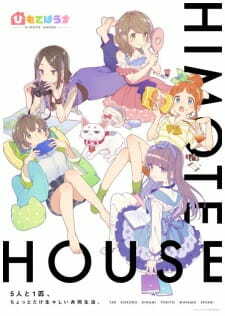 Himote House follows Tae Hongou voiced by Aya Suzaki who's friends and has moved in with Kokoro Himote voiced by Satomi Akesaka, the youngest of the Himote sisters and well Tae gets acclimated into Kokoro's house but with Kinami voiced by Suzuko Mimori, the middle of the Himote sisters and Tokiyo voiced by Kaoru Mizuhara, the oldest of the Himote sisters and finally one of Kokor's friends Minamo Arai voiced by Sumire Uesaka and a talking cat voiced by Asuka Nishi and all of them cept the cat have superpowers. But like LA said, this anime is more ad-lib than about the actual premise LA layed out and guess what the ad-libbing part of this anime short is the best part of it and oddly enough the anime short seemed to quickly know this as the anime short becomes nothing but the voice actors still in characters ad-libbing with funny literal of the "top of the bag" scenarios. Himote House DOES have some scripted scenarios for the actual characters themselves just to loosely flesh out each character and whatnot with some absurdist comedic moments to go along with it but seriously the best parts of Himote House comes with it's "Himote House Competition" ad-libbing and general ad-libbing where LA clearly sees that the voice actors are having fun with the obviously weird premise each of the "out of the bag" scenarios and the voice actors line of thinking lead into, heck they even reference Bitcoin, Youtube and the freakin' TPP of all things and with how natural the voice acting is and considering it was all ad-libbed, of course it sounds natural especially with the voice actors constantly stumbling and laughing like crazy with some of the weird conversations the cast does and LA loves this kind of semi-meta humor from the voice actors because of that. Sure Himote House's animation done by Bouncy, well it's 3DCGI use was jarring and low quality but in getting the voice actor's inflictions and characters reactions were decent enough and at least they kept the entire anime short entirely 3DCGI instead of trying to switch between traditional and CGI. The voice acting department, well what can LA say, this is a first where LA has seen voice actors outright stay in their character roles but it's more the voice actor's personality shining through. It was a bit hard to get used to Kaoru Mizuhara's elongated inflictions as Tokiyo as Kaoru herself doesn't have this cadence when speaking normally through ad-libbing. But if LA had to pinpoint a MVP...then...Suzuko Mimori for how much crazy range, both ad-libbing and character-wise she was. LA can't hate Himote House and for a person largely following voice actors, this anime short was a refreshingly absurdist look at ab-libbing taken anime form, with a brilliant voice cast without a care in the world and LA says this in a good way, sure the animation especially the 3DCGI is jarring but it's the voice acting that is it's main strength and shining point of this anime short. Want to see voice actors cracking up laughing over the silliest premise...then go into Himote House.